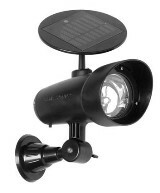 Solar spot lights can accentuate your home and garden in unique ways. Solar spot lights can emphasize a certain area of your home, uplight trees and shrubs or other garden ornaments, and illuminate your house numbers for all to see. You can also use these solar landscaping lights to cast a wash of light on a smaller wall of your home, such as along a walkway next to your home. Basically, any smaller feature of your home or garden that you want to highlight, you can do with this type of outdoor solar lighting. These solar landscaping lights are best used when they are positioned a few feet away from the object you want to brighten. These solar lights cast a soft tone of light but are not too intense. If you want a much brighter light to emphasize larger areas then you will want to consider using solar flood lights. These Solar spotlight is ideal for gardens, driveways, pathways or anywhere you want to accent flowers , trees or other objects around your landscaping. Just stick in the ground and let the sun charge the battery and its ready to go. The light and solar panel are adjustable to get the best lighting and access to the sun. Includes 3 lights per order. You can use this in the ground or mount it on a wall. Return from solar spot lights to outdoor solar lights. Return from spot lights to solar energy scene home.